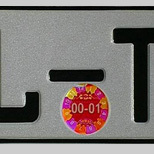 SURYS offers car plate labels as a first answer to car plate trafficking. 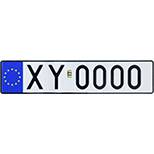 As a security upgrade on an existing car plate, SURYS car plate labels are easy to implement into current issuing process and fully compliant with car plates lifecycle. Featuring a high-security DOVID, their eye-catching properties facilitate controls. and are easy to remember. As a complete system, the Optoplate™ solution guarantees the authenticity of car plates at different stages while ensuring their efficient traceability. Each consumable part involved in the production of car plates is highly secured and traced. 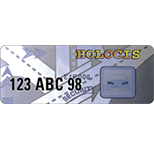 – Personalized Retroreflective foil with metallic marks reflecting the light with the same angle as the incident angle which creates a good visibility of the license plate number. – Personalized lenticular effect which combined with a specific high definition digital personalization creates a “Moiré” effect. The Optoplate™ is designed to be easily personalized, which is one of its key assets. Indeed, the personalization of the Optoplate™ is done by digital printing onto the retro-reflective foil prior to protecting it with the acrylic plate. The Optoplate™ can be issued at a car plate dealer or through a centralized car plate manufacturing process.